South Africa's ruling party has elected a new leader, Cyril Ramaphosa, who will likely be the party's presidential candidate in the next national election. But will Ramaphosa, who was not the outgoing president's pick, be able to overcome the massive challenges ahead for the party? The party's electoral commission announced the results Monday after a tense party conference in Soweto, saying "Comrade Nkosazana Dlamini-Zuma received 2,261 votes, and comrade Cyril Ramaphosa received 2,440 votes." Ramaphosa, a successful businessman and current deputy president, has promised to bring business-friendly policies to South Africa. But that may not be what pushed him over the top in this tight and tense vote to lead the African National Congress party. His opponent was Nkosazana Dlamini-Zuma, a former top diplomat and minister who was also, for 16 years, the wife of the South African President Jacob Zuma. Zuma is still president — his term as leader of the nation ends in 2019. But Zuma's popularity has sunk lower and lower, as he dealt with one corruption scandal after another. Delegates wait for the delayed start of the ruling African National Congress (ANC) elective conference in Johannesburg, Dec. 16 2017. 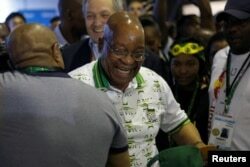 Nearly 4,800 ANC delegates participated in the conference in Johannesburg, which was beset by massive delays as the deeply divided party argued, behind closed doors, about procedural issues. Earlier Monday, a grinning Zuma toured a collection of statues of South African liberation stalwarts, pausing to pay his respects at the bronze images of former President Nelson Mandela and former ANC president Oliver Tambo. South Africa's President Jacob Zuma reacts during a tour of the Nasrec Expo Center where the 54th National Conference of the ruling African National Congress (ANC) is taking place in Johannesburg, South Africa, Dec. 18, 2017. He refused to answer journalists' questions, but took a few minutes to address the crush of reporters. "I'm happy to say now I'm bowing out very happy because, I think, from my own point of view, I I made my contribution," he said. Many of Zuma's critics — including many high-profile party members — say his contribution to the ANC has been to destroy its image as a party of liberation and equal opportunity. Funde Sonwabo, a delegate from Gauteng, said he had voted for Dlamini-Zuma, but was happy to support the winner. He acknowledged that the ruling party -- which he has belonged to, he said, since he was 20 — has issues. The ANC has lost ground in recent elections, losing control of three major cities to the opposition. "We do have problems," he said, "and I'm glad that our leadership is admitting that we do have problems. But then, we can't continue moaning and analyzing the problems. We've got to work out strategies of how to get out of the situation in which are." The party's outgoing treasurer general, Zweli Mkhize, said party leadership is aware of calls for Zuma to step aside as president now that his term as party leader is over. "We took a discussion, that discussion, in the past," said Zweli. "When it arises I think the ANC must deal with it at that point. At the moment, that issue hasn't arisen." But with Ramaphosa's elevation to head of the powerful party, many ANC watchers predict that issue may arise again.